With Chinese President Xi Jinping’s approaching Pakistan, a three-day conference in the picturesque Chinese island of Hainan decided to launch a new Joint Pakistan-China Think Tank dedicated solely to research and development of the China-Pakistan Economic Corridor. “The new think tank is the first joint initiative of China and Pakistan which will be dedicated to research on the China-Pakistan Economic Corridor,” said Senator Mushahid. It would be emphasising in providing an ‘Information Corridor’ to promote perspectives, data and information for policy-makers, students, specialists, scholars and companies of both countries. 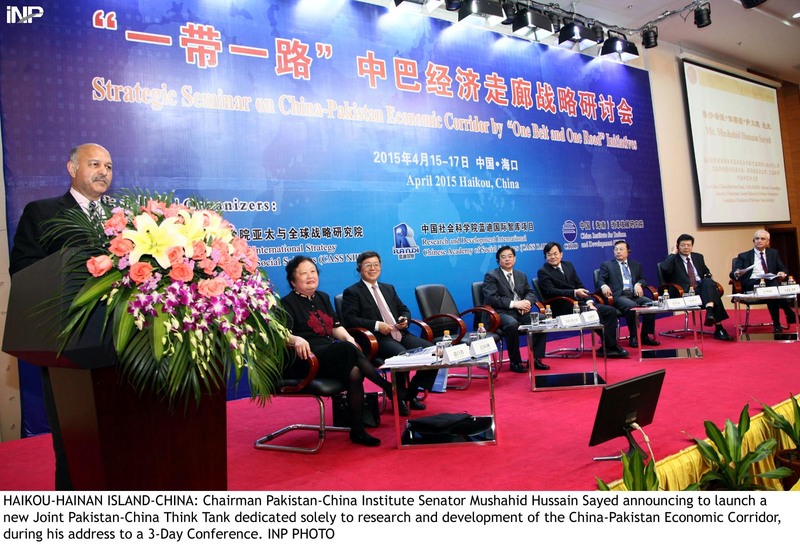 The Information Corridor was organised by China’s most prestigious university, Tsinghua University, under the supervision of Professor Li Xiguang, who is also director of the Centre of Pakistan Studies, who had also addressed at the conference. The Pakistan secretariat of the new joint think tank, RANDI, would be located at the Pakistan-China Institute in Islamabad, while its China secretariat would be co-hosted by the Chinese Academy of Social Sciences (CASS) and the China Institute of Reform & Development (CIRD), two top Chinese think tanks. A work plan for 2015 was also approved at the conference, which was attended by former Finance Minister Senator Saleem Mandviwala, Pakistan Red Crescent Society Chairman Dr Saeed Elahi, with representatives of the Board of Investment energy, economic experts and Gawadar Development Authority. how about calling it RDI instead of RANDI? Well Congratz for Good deals and mou’s they signed….May Pakistan Not have to sell their land to chinese again………..
Join the discussion on the facebook group: "Pakistan World Peace Daily"
We all knew Pak was sleeping with China, but did they have to make it so obvious? maybe a better name would have been CHINAL. Could not stop laughing.What a stupid name?The Chinese might not be knowing the meaning of the word but Pakistan !!!!. Folks grow up when you are leaving comment and for a change be positive. We all know what is going on in India and Pakistan and level of corruption in both countries so both Indians and Pakistanis do not have room to talk. The abbreviation should be termed as RDI. نجدد ترحابنا بكم في العاب بنات التي تعتبر من افضل الالعاب على الاطلاق وعندها جمهور كبير جدا وهي بدورها تتضمن التلبيس والمكياج وكذلك الطبخ وتلعبها البنات بكترة واصبحت مشهورة جدا في السنين الاخيرة مما جعل مواقع الالعاب تصبح كتيرة وهناك كتير منها مشهورة متل فرايف و كيزي ومواقع اخرى كما ان هناك ايضا موقع جميل عربي يقدم تشكيلة من العاب بنات مميزة ومتجددة يوميا هذا النوع بدوره يشمل اصناف كتيرة سنتعرف عليها الان ومن بينها العاب الطبخ الدي يملك معجبين كتر جدا ويعتبر هو الاول تم يليه العاب التلبيس وهذا الآخر ممتع ويحبه الكتير لان التلبيس تعشقه البنات اكتر من الاولاد وهذا امر بديهي ومعروف وبعده بالتتابع يوجد العاب المكياج او الميك اب نوع جميل ومحبوب عند الصغار والكبار ويبقى في الاخير نوع قص الشعر وهو الاقل اهتماما..
Pakistan think tank is way more funny that expectations just wait and watch.